I’ve always felt wooden boats have a lot of character. Like people with strong character, wooden boats often have idiosyncrasies that require some attention. Our schooner is a lovely creature, and as time goes on she gets more and more character. In the fall of 2009 the crew of Lois McClure discovered a “soft spot” at the top of the foremast. Museum boat builder Rob Thompson determined the extent of the rot and with masterful skill made a repair by scarfing in a new section. Unfortunately the rot ran deeper than any of us anticipated and last fall we discovered more rot rearing its ugly head. Fearing another repair may only be temporary; the decision was made to make a new mast. I ran down to the local lumberyard and picked up the 42-foot long 10-inch diameter flawless piece of white spruce right off the rack. No, that’s a lie. In fact it just isn’t that easy to find a “good stick” these days. The search was on. I went back to the original source of Lois’s spars, Currier Forest Products. I remember seeing pictures of Burlington Schooner Project coordinators Don Dewees and Mike LaVecchia out hugging amazing spruces in the woods and figured if Currier had done it once, maybe they could do it again. When I called the sawyer I knew right away why Don and Mike had elected to use them back in 2000. Joel Currier has an easy way about him and after a few minutes of talking it became evident that he knew his business very well, and to top it off he had just gotten a few logs in the yard that were good candidates. I put him and Rob in direct communication so Rob could give him the specs and they could “talk shop.” Rob felt confident we had the right guy and Joel had the right tree. I’m not an expert on wood, but I’ve been around enough boats, shipyards, saw mills, and shipwrights to get a good feel and healthy respect for trees and those who make their living with them. I used the excuse of “inspecting” to be present when Joel and his business partner John starting milling the magnificent spruce at their mill in Danville, Vermont. The vibes over the phone were right on. Both Joel and John are down to earth and know their trade. When my daughter Emily and I arrived John was busy debarking. The selected spruce was a freak of nature. At forty-four feet I could only see a half dozen knots at one end. The tree had forgotten to grow branches! We all hoped that when the cut was made the trend would continue, but as Joel said, generally surprises in the mill are unpleasant. Fortunately the surprise this day would be a good one. All indications of a clear tree, free of rot and bad knots, held true as Joel and John cut the log square. The log will be shipped to the former Burlington Shipyard at LCT’s King St. ferry dock where Lois was originally built. 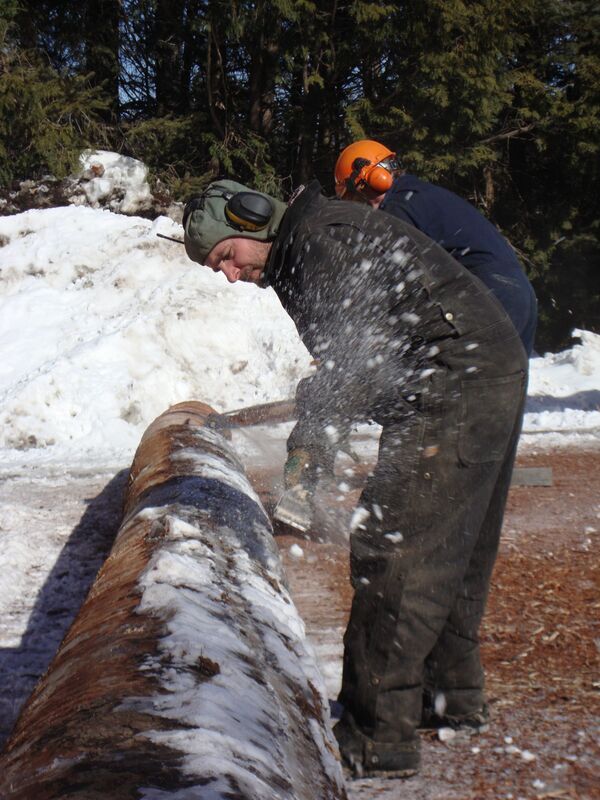 This spring Rob will continue to shape her into a copy of our original foremast, minus the rot. It’s wonderful to know we’ve got such great foresters and sawyers like Currier Forest Products, whose sustainable forestry practices will keep us supplied for generations to come.